A £20m fund to improve air quality and 50mph speed limits on stretches of five main roads and motorways are being brought in to tackle emissions. 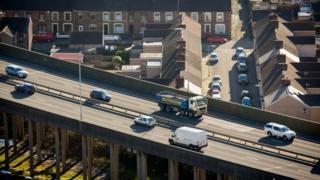 The Welsh Government wants to cut nitrogen dioxide (NO2) levels on roads where they are above legal limits. The High Court had ordered ministers to act after they failed to meet EU targets on air pollution. The environment minister said it was about doing the "right thing" for the environment and people's health. A consultation will open on Wednesday on the plans. A470 between Upper Boat and Pontypridd (to A4058 roundabout, 4.2km). The plans also include Clean Air Zones where action is taken to reduce public and environmental exposure to airborne pollutants. Road transport is a source of about a third of nitrogen oxide emissions in the UK. How does it look across Wales? Five Welsh monitoring sites - Mountain Ash in Rhondda Cynon Taf, Hafodyrynys in Crumlin, Caerphilly county, M4 Junction 25 at Newport and Hafod and High Street in Swansea - exceeded the annual mean objective for nitrogen dioxide levels. The A472 Hafodyrynys road - which has been dubbed Wales' most polluted road - also exceeded the air quality objective for hourly mean nitrogen dioxide concentration on 60 occasions - 42 times more than allowed under EU law. In 2016, monitoring stations in Wales recorded 70 days with "moderate" concentrations of nitrogen oxide, one day with "high" levels and no days recorded as "very high". Aston Hill, Cwmbran, Marchlyn Mawr and Narbeth exceeded objectives for ozone on more than 10 occasions. "This is not just about legal compliance," Environment Minister Hannah Blythyn told AMs. "It's about taking action to improve the air quality of everyone in Wales, for the health improvements this will deliver and because it's the right thing to do." But the Welsh Conservatives accused the Welsh Government of being slow off the mark. Plaid Cymru said it was "shameful" it had taken a response to a High Court case to reach this point. Air pollution is thought to contribute to 2,000 deaths a year in Wales and is second only to smoking as a public health priority according to Public Health Wales. The new speed limits are about doing something quickly to cut emissions on stretches of road where pollution has long been a problem. But the government insists they will be temporary. Longer term, a shift to low carbon vehicles will be needed and measures to encourage more of us to abandon our cars in favour of public transport. We should get more detail when two consultations on air quality are published on Wednesday. Andrea Lee, of campaign group ClientEarth, which brought the legal action in January, said the draft proposals needed to show exactly what action the Welsh Government was going to take to bring air pollution within legal limits in the shortest possible time. "The Welsh Government has already admitted that it has been slow off the mark in dealing with this public health crisis," she said. "We will be scrutinising these draft proposals to uphold people's right to breathe clean air across Wales." The RAC said it supported clean air zones in principle but it was "questionable" whether reducing the speed limit to 50mph on two stretches of the M4 which were regularly subject to major jams would make a difference to pollution. "Slowing down traffic can help to improve flow, but if there are simply too many vehicles for the road space, then jams are still likely to occur so this is as much a question of capacity as anything else," said head of roads policy Nicholas Lyes. The AA said older trucks, buses, taxis and badly serviced cars needed to be targeted and it should not be about "demonising all diesels". Edmund King, AA president, added: "If speed limits are to be reduced on parts of the M4 in Wales it should be a flexible system that varies speeds and is inked to air quality monitoring so the speed limits are only reduced when air quality levels are exceeded." Joseph Carter, of the British Lung Foundation, welcomed the announcement and that ministers wanted to "meaningfully reduce the impact pollution has on people's health and the environment." But he said there needed to be new legislation to underpin the clean air zones to allow local authorities to implement them.